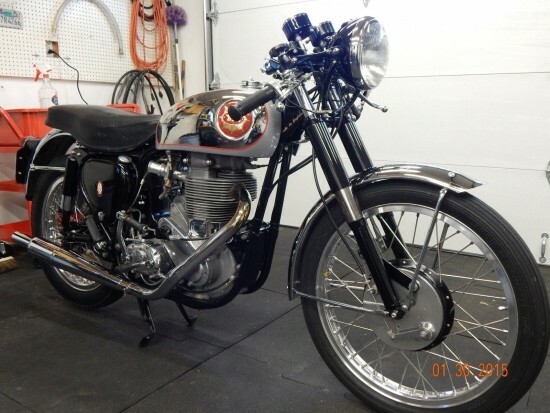 The first road bike to wear the Gold Star name displaced 496cc and was built up until the outbreak of World War II. 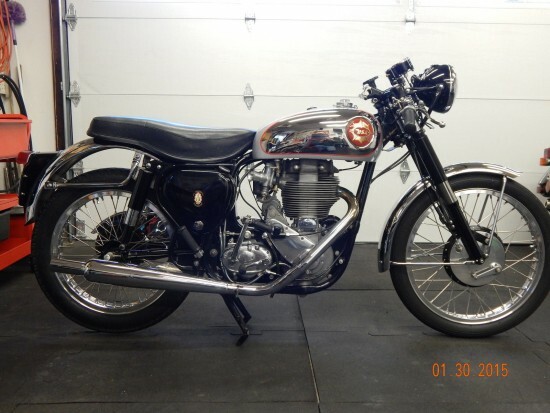 Postwar, BSA introduced a 348cc version of the Gold Star, and this lightweight, basically hand-built hot rod was successful in a number of different competition classes, including both on-road and offroad racing. A 500cc version was reintroduced in 1950 and built alongside the 350 until 1956, when the 350 was discontinued. This Gold Star features the optional “CB” engine with a slightly different appearance but, more importantly, reinforced internals for increased performance. This exact bike dyno’d at 38.2 bhp when new: Gold Stars were tested at the factory before being delivered to verify performance of each machine. History: Included documentation as provided by the Gold Star Owners Club, Great Britain Registrar shows that this bike dispatched to Hap Alzina, USA in Clubman trim on 4 December 1954 with engine number CB34GS308 and frame number CB32 1694. A copy of the original factory Engine Brake Test is also supplied and shows this bike was tested in clubman configuration and produced a maximum B.H.P. of 38.2 at 6500 rpm fitted with a GP carb on Oct 21, 1954. Also included in the auction is the original Lucas Mag/Dyno with new points installed. There is nothing wrong with this mag/dyno. I ran the bike with the Lucas installed for approximately 300 miles before installing the BTH. I installed the BTH because I wanted the ability to set timing and forget about it and the advance curve. 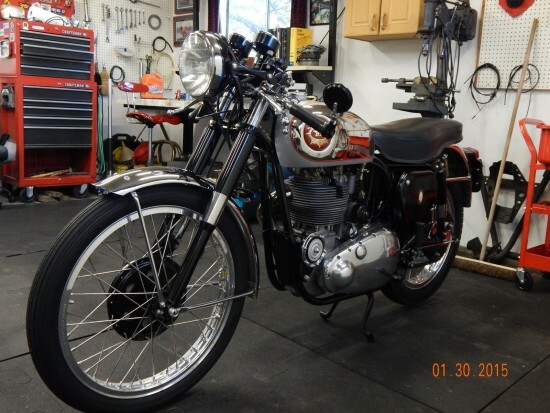 I ran a BTH in my Velocette and loved it. Note that the tag (see pics) on the BTH indicates Lucas. BTH Components goes out of their way to retain authenticity in appearance. The BTH is solid state and makes starting a breeze and allows the bike to idle nicely with the monobloc installed. The TT carb is a racing carb and does not have an idle adj/stop screw, however, when up to running temp the bike does idle nicely with the TT. There is also an original BSA tool kit included. I did not take pics of the tool kit but can do upon request. I installed the Nova Racing gear cluster because I was unhappy with the ratios of the original scrambler box in the rolling hills here in Northern California. It doesn’t get any sweeter than a Nova 5 spd. The clutch plates are near new with very little use. 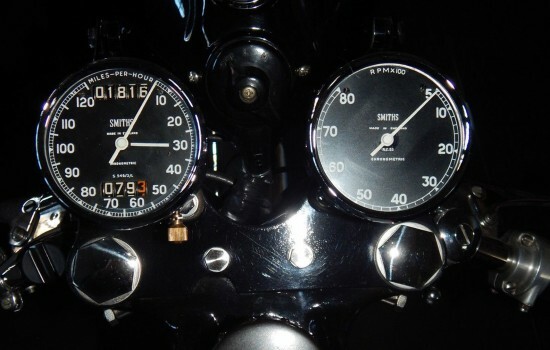 I have put less than 1500 miles on the bike since installing the TT carb, Nova 5 spd, and BTH mag. 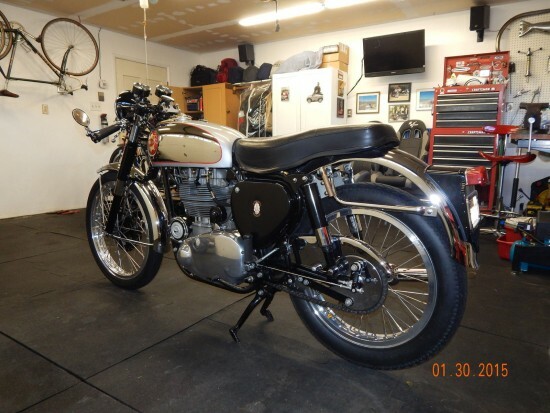 This is essentially a new CB34 Gold Star with original engine and frame numbers as shipped from the factory in 1954. The bike has been well cared for and is in pristine condition. The title is clear and in my name. It is registered in the state of California and expires in Feb this year. I will most likely non-op the bike if it does not sell before Feb 16 as I am unable to ride it due to health issues. Bidding is up to $15,000 with several days left on the auction. Gold Stars have held their value very well, and this one looks to be in nearly perfect condition with very desirable upgrades. They’re always in demand: if you’re a fan of classic British iron, you probably lust after a Gold Star… They embody everything people love about classic bikes: they’re fun, characterful, and involving. Parts are available to keep them running and they sound the part, with enough performance to make a weekend ride rewarding. The Brit’s sure have the corner on timeless styling. Any “café” builder need not apply here. Doesn’t get any better.